Flower of Life Cream is my ode to the beautiful fragrant flowers of the world. Scented with the rare oil absolutes of Blue Lotus, Linden Blossom, Plumeria, Tuberose, Rose, Neroli and Rock Rose, Flower of Life Cream uplifts the soul while nourishing the skin with rich mango butter, anti-oxidant fruit oil and soothing Neroli hydrosol. The Flower of Life Cream is an excellent anti-aging moisturizer and works wonderfully on the face or body. The cream feels luxurious applied after a Honey Lotus Milk Bath. Flower of Life Cream is my ode to the beautiful fragrant flowers of the world. Scented with the rare oil absolutes of Water Lily, Linden Blossom, Plumeria, Tuberose, Rose, Neroli and Rock Rose, Flower of Life Cream uplifts the soul while nourishing the skin with rich mango butter, anti-oxidant fruit oil and soothing Neroli hydrosol. 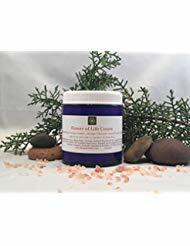 The Flower of Life Cream is an excellent anti-aging moisturizer and works wonderfully on the face or body.